Being intentional about reading the Bible is important. If we don’t have some methodical reading plan, then we tend to read the parts of the bible we love the most. 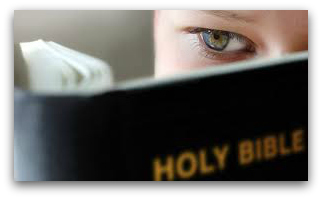 Below are some references to some Bible reading plans and Bible reading devotionals. There are differences between plans and the devotionals. The plans are just that – a day by day schedule of what passage to read in the Bible. Most of these plans take you through the Bible in one year. The Bible reading devotionals are more than just a methodical way to read throught the Bible, but they include thought provoking commentary and some life application quesitons. It must be understood that these devotional thoughts / commentaries are not inspired by God. Whether you choose the reading plan or reading devotional, you will be blessed because they both get you into God’s Word. If you Google “Bible Reading Plans, you will find a TON of options out there on the web. One place that is a “clearing house” for a variety of Bible reading plans is Ligonier Ministries. Below are a few links to some of the more popular plans referenced on their site. 3 Year Bible Reading Plan – This plan has you reading just one chapter a day and it gives some variety by going back and forth from the Old Testament to the New Testment. Chronological Reading Plan – Contrary to popular belief, the Bible is not arranged chronologically. It is very interesting to read it in chronolgical order and that is what this plan does. Through the Bible – This reading plan will take you through the Bible staring with the first book of the Bible and going straight through to the last. The McCheyne Bible Reading Plan – This plan has you read from four different parts of the Bible each day to give you a lot of Bible intake variety. 52 Week Reading Plan – This reading plan has you go through the Bible methodically but does so by having you read a different genre of Bible literature each day of the week adding to the variety. Discipleship Journal Plan – A Bible reading plan made popular by the Navpress magazine by the same name. If you’d like to see ALL of the plans listed at the Ligonier site just click HERE. 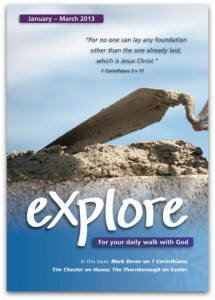 Explore The Bible takes you through books of the Bible each quarter. This devotional Bible reading resource invites the Bible reader to interact with the text of Scripture by asking questions as you read through the assigned Bible passage for the day. This resource is available in print and mobile (iOS and Android) editions. Check it out! 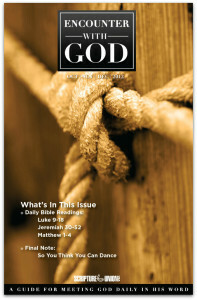 The Encounter with God Bible reading devotional is another great option. This resource also takes you through books of the Bible. It is put out by Scripture Union. It also is available in print and mobile editions. In addition to that, you can view each day’s entry online for FREE or have each daily reading delivered to your email inbox. Check it out!